Enhance the decor of your toddler with this beautiful Field of Flowers design. We print water based inks on our Toy Storage Chest finished in white. SAFETY FIRST: We use the very best lid support available; the lid support ensures your toddler's safety by holding its position at any angle. Your toddler's safety is further assured with cutout handles and a front finger cutout. 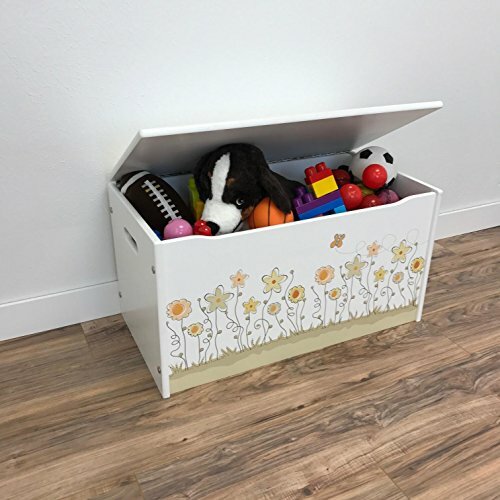 PREMIUM QUALITY: Our Toy Boxes are made of MDF for a smoother finish and are only available in White. We only use Plum Creek brand MDF, the best in the industry and certified for no added formaldehyde. HANDCRAFTED: This flower themed toy box was built by our professional woodworkers, who ensure each toy box meets our highest standards. ASSEMBLY INSTRUCTIONS: Comes in a ready-to-assemble design that is more affordable to ship and easier to store. The lid comes fully constructed. AMERICAN MADE: All our products are handmade in Denver, USA.